"A unique theme for an original anthology. ... Best stories from my sampling were William Kent Krueger's Minnesota mood piece "The Far Side of the River" and Eddie Muller's New Jersey-based "Last Call," brief but complex with an inventive narrative structure." 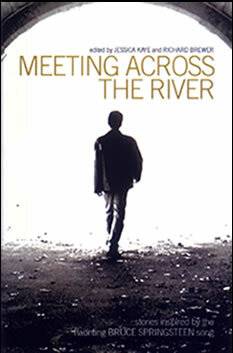 Here's what the publisher says: "Meeting Across the River" is a song with an evocative melody and lyrics that unfold like a noir fable: a man down on his luck but desperate to make things right with his girl tells his buddy, Eddie, that they have to get across the river for a last-chance meeting with someone, all in the hopes of a big score: two grand. With that money, our hero can win back his girl and all will be right with the world-but if he and Eddie screw up, the consequences will be grave. Authors including Eric Garcia, C. J. Box, Barbara Seranella, David Corbett, Gregg Hurwitz, and Steve Hamilton, among others, have written imaginative, heartbreaking, funny, and bold stories based on this classic American story of hope and despair, each a surprisingly different experiment with character and plot. For as familiar as this story is, Springsteen's spare lyrics leave much unsaid. How these authors fill in the absences is what makes this collection, published a month before the thirtieth anniversary of the release of Springsteen's Born to Run, such an unusual treasure, proving that, just as with music, in literature no two performances are alike. SAYS EDDIE "I was a complete Bruce-head in my youth. Still am, really. I even wrote a screenplay ("The Beat") for him when I was about 23. I at least managed to parlay it into a backstage meeting with Clarence Clemons when he played The Stone in S.F. with the Red Bank Rockers. I'd written a hell of a good part in this script for the Big Man, and he was psyched about the story and his fledgling acting career. Ah, well – too late now. We're all too old, and today there's nobody – NOBODY – who can bring it like The Boss did in the late seventies. Kids, don't try it. You'll only hurt yourselves."